UPDATED: Thu., Dec. 14, 2017, 10:50 a.m. The Spokane Regional Health District board has thrown its weight behind a three-year-old campaign to raise the state’s tobacco age limit to 21. The board, which is made up of a bipartisan group of elected officials from around Spokane County, unanimously approved a resolution last week calling on the Legislature to raise the purchase age for cigarettes, vape products and other tobacco products. Health officials and supporters of the measure say it would decrease youth smoking, especially among younger teenagers who have easy access to cigarettes because 18-year-old friends can buy them and share. “I started smoking when I was 13 because a high school senior bought me a pack of cigarettes,” said Mary McHale, the American Cancer Society’s Cancer Action Network government relations director in Olympia. McHale quickly developed an addiction and then quit at 24 after becoming a parent. “I couldn’t stand my daughter associating the smell of tobacco products with someone she loved,” McHale said. Supporters on the health board included city councilmembers Karen Stratton and Breean Beggs, as well as county commissioners Josh Kerns and Mary Kuney. Stratton said she struggled with the decision since 18-year-olds are legal adults who can vote and enlist in the military. But she was persuaded by public health data, and the idea of making it legal to use tobacco, alcohol and marijuana at the same age. “For me, I looked at it as a big public health issue,” she said. Data backs up supporters’ claims. The Institutes of Medicine, a nonprofit health research organization, studied the impacts of raising the tobacco purchase age in 2015. They concluded that raising the age to 21 would decrease the number of 15- to 17-year-olds starting smoking by 25 percent. But some young smokers are skeptical. Dakota Black, a 16-year-old smoker, said she picked up the habit at 12 after watching her mother smoke. The family was homeless and living in a tent at the time, and Black’s mother would smoke when she was stressed. Black figured the same thing would work for her, too, so her mom bought her cigarettes. “No matter how old you are, you’re still going to get cigarettes if you want them,” she said. Now, she has a 3-month-old daughter and is working to finish high school. She said she’ll quit eventually when she’s “not so stressed,” but she’s not in a hurry. “I’ve seen people with trachiotemies and stuff, and I’ve said, ‘Man, I don’t want to be like that,’” she said. But compared to other drugs she could be using, tobacco is the lesser of many evils. “Smoking is the least harmful thing that you can do,” she said, comparing it to other options like methamphetamine. Jacob Stewart, 31, also started smoking young after seeing his parents turn to cigarettes. He wants to quit and knows it’s bad for him, but said he doubted raising the age would have changed his life. “I’d support it, but it’s not going to make a difference,” he said. Beggs, who voted for the resolution, said no change can stop all youth smoking. But stopping some young people from starting to smoke is still worth it. “It will make a difference for some people, and we’ll save lives and save money. And I don’t see a particular burden,” he said. State law doesn’t allow cities or counties to adopt their own rules on smoking, so the only option Spokane has is pushing the Legislature to act, said Linda Graham, the health district’s policy analyst. 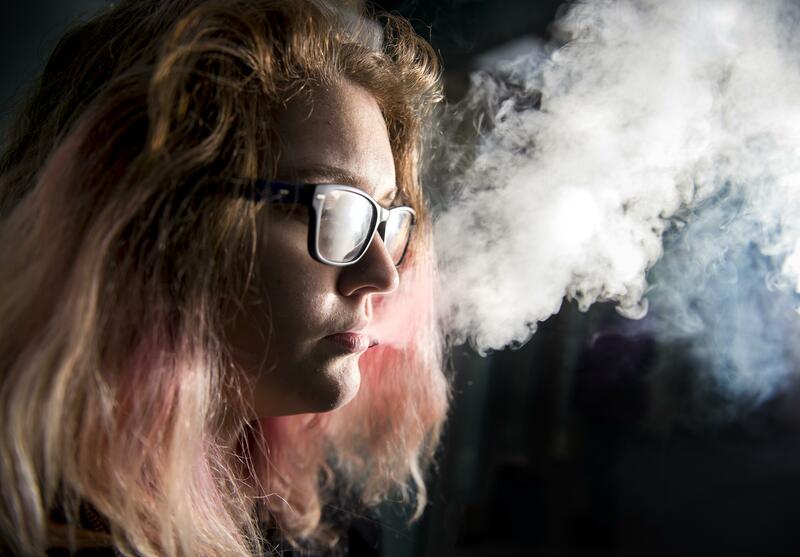 Many teenagers start with vaping, she said, which is often perceived to be less dangerous or harmful than smoking cigarettes. But many people who start vaping end up smoking later. The resolution also says 90 percent of people buying cigarettes for minors are between 19 and 21, suggesting cutting off their access would limit the access of younger teens. “It’s an older sibling, an older schoolmate or someone in the neighborhood,” Graham said. A bill to raise the tobacco age has failed to pass the Legislature for three years running. McHale said the fiscal impact has been a source of concern. A fiscal report on the 2017 bill projected raising the tobacco purchase age to 21 would decrease state revenues by $5 million in the first fiscal year and $11 million the following year due to decreased tax collection on sales. But that doesn’t take into account the health costs of tobacco-related illness. Tobacco-Free Kids, an advocacy group, estimates Medicaid in Washington spends about $788 million annually on smoking-related medical care. The American Cancer Society argues that cost shouldn’t count. “We shouldn’t balance the state budget on the backs of teenage smokers,” McHale said. This article has been updated to correct details about how McHale became a parent. Published: Dec. 14, 2017, 6 a.m. Updated: Dec. 14, 2017, 10:50 a.m.